The Bulls haven’t had much of a shot lately, now losers of their seventh consecutive game with Thursday’s 103-92 loss to the Miami Heat. The Bulls don’t much make shots these days, scoring fewer than 100 points for the third consecutive game and fourth in the last six. It doesn’t help that their four leading scorers this season are pretty much shot, either out injured or in New Orleans, an average of 62 points per game mostly looking on. So at least this time someone got mad and decided they weren’t going to take it anymore, doing a little shoving and a little shooting from the lip. Not surprisingly it was the phlegmatically emotional Robin Lopez, back starting at center amidst the many casualties and with some well timed verbal shots which got him ejected in a heated exchange with officials that was both colorful in its language, response and spectacle. “There was frustration out there, obviously,” said the normally stoic Bulls coach Fred Hoiberg, who also was assessed a technical foul earlier. “I was frustrated the first half with a couple of things that went on out there as far as the consistency on the floor, but it happens. Just got to go out and keep battling through that and I thought our guys did for the most part. “Robin’s an emotional player. He’s a guy everybody loves as a teammate because of his passion on the court; it’s good to have him out there for extended minutes. It also was no coincidence that for the first time in 10 games with Lopez playing his most minutes since before the All-Star break, the Bulls yielded fewer than 110 points. 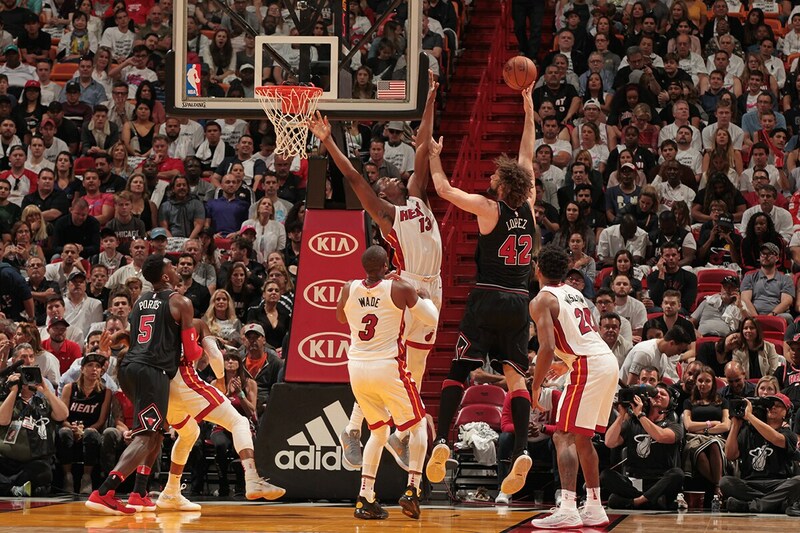 The Bulls after Lopez’ fourth quarter ejection also cut a 19-point deficit to nine with 2:10 left in the game as the Heat could score just twice in 13 possessions. But there’s just not enough potency in the Bulls offense these days to match Lopez’ fireworks. All five Bulls starters scored in double figures, but led by David Nwaba with 15 points. 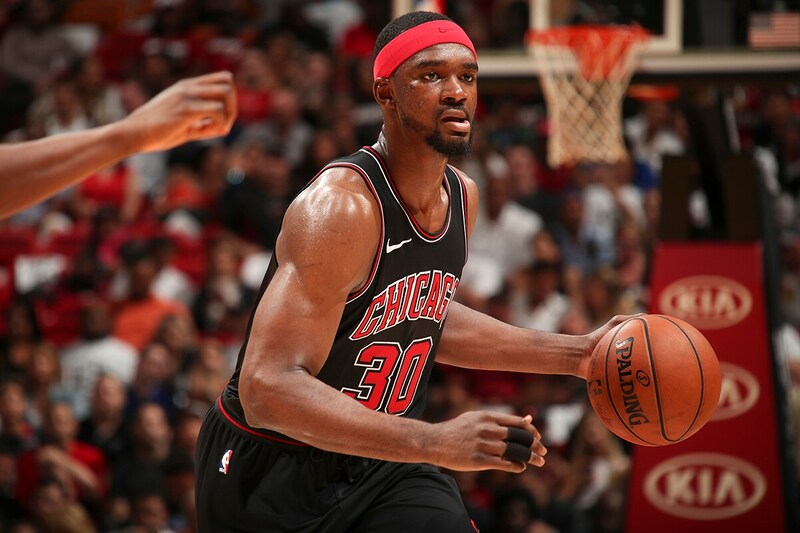 He was the most aggressive along with recent acquisition Noah Vonleh with 14 points and 13 rebounds, his second double/double in the last three games. Since getting regular playing time the last seven games, Vonleh is just short of a double/double averaging 9.7 points and 9.9 rebounds. Bobby Portis had 13 points and equalled a career high with 16 rebounds, seven offensive. He is relentless and has emerged as perhaps the team’s most consistent player this season. Though with his lack of explosion at the basket, Portis had several put back attempts blocked and had six turnovers. Justin Holiday starting with Lopez had 13 points along with Lopez and Cameron Payne had 11. The Bulls dropped to 24-51 and face the 22-52 Orlando Magic Friday in one of those matches most watched with draft lottery ramifications. Miami is seventh in the Eastern Conference at 41-35. Zach LaVine, Lauri Markkanen and Kris Dunn were all out injured for the Bulls along with Paul Zipser, Antonio Blakeney and Cristiano Felicio. Omer Ask was active, but he didn’t play. Lopez did play after sitting out mostly since the All-Star break for the team to analyze and judge its younger players. Lopez’ presence was apparent with his force on defense with three blocks and a rare Bulls rim protector. Though especially in his inspiration. Bulls players have been looking around recently and seeing the summer. When they look at Lopez, they see the heat. And then the officials felt his fire and fury after back to back offensive foul calls early in the fourth quarter. The Bulls, in their best effort in the last two weeks, were within 68-64 late in the third quarter, contesting, rebounding, fighting back for a change. 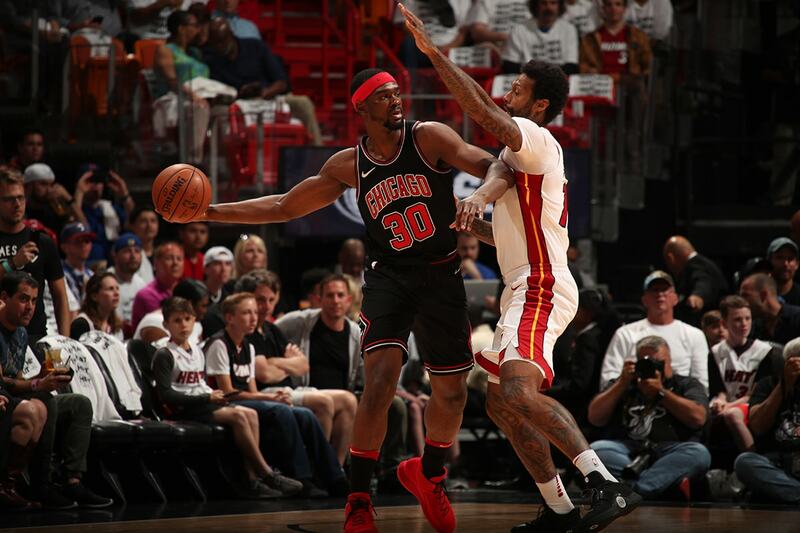 The Bulls outrebounded a physical Heat team 50-44, led 20-7 on second chance points and even somewhat curtailed their belief they can shoot threes with a 50-48 advantage in inside points. But the Bulls did toss up 26 threes, making six, an early third quarter mental lapse in believing they were the Houston Rockets. That stretch enabled Miami to break from a 51-48 lead to 66-55 before Bulls players again began deciding to get closer to the basket before shooting. Nwaba played a big part in the challenging play. And though the Bulls trailed 78-68 after three quarters when Bulls legend Dwayne Wade head faked them into a pair of shooting fouls — and they should know better seeing him all last season — the Bulls were answering this time. And then Lopez answered loudly, vociferously and colorfully, finally escorted out as Lopez almost mimicked Joakim Noah’s famous theatrical ejection in Sacramento a few years back with his own observations for the arbiters. As angry as Lopez becomes over basketball injustice and as committed as he is to the game, he’s as composed and pacific afterward. It’s often uncomfortable for media members to question a player after that kind of incident, the player often irascible irritable about the circumstances, the potential fine, the embarrassment. Lopez is professional in such circumstances. He’s not loquacious, nor does he generally elaborate in great detail. But he is honest, direct and always makes media members feel comfortable. He’s not above an apology, if needed, but don’t mention mascots. “I thought the first one was warranted,” Lopez said evenly. “I got my money’s worth on that one. The second one, I was venting and walking off the floor, so I don’t feel it was quite as warranted. I’m sure Rodney (Mott, lead official) wanted to grab the game by the horns and wrestle control back to the officials. I suppose I understand it. “I’d had a conversation with the refs earlier (about incidents) that really didn’t result in…,we didn’t come to any kind of conclusive end. I wasn’t very pleased with that,” Lopez explained. “I was emotional, I was banging around, I had a large reaction. He hit me with that first T. I felt like I was never really given the time or space to cool down. I was making my way toward the bench and I felt I was hit with that second T right away. I was a little caught off guard. I suppose it was deja vu; it’s happened before. I shouldn’t have been caught off guard. How naive I was. “It’s not something I’m particularly ashamed of (the emotion),” Lopez said. “I get caught up in the game. I play with passion. If I do something I feel is wrong, I’ll apologize for it; if not, I’ll stand by it. I overreacted with the first technical. I understand what they are trying to do when you get that second technical. I understand I should have left the court in a little more hasty manner. I screwed up, I’m being penalized as I should be. But I feel like the refs always end up with a last say on things; it’s kind of as it should be, but we are limited in what we can say." There is no basketball Bill of Rights. But when you believe you are right it’s your right to stand up and make your case. It’s our history; it’s basketball, too. You want a little more Robin Lopez with your coffee. Well, maybe he doesn’t need more coffee. You often don’t realize how much you miss someone until they are gone. The Bulls could use a lot more of what Robin Lopez brings other than the scoring and rebounding.